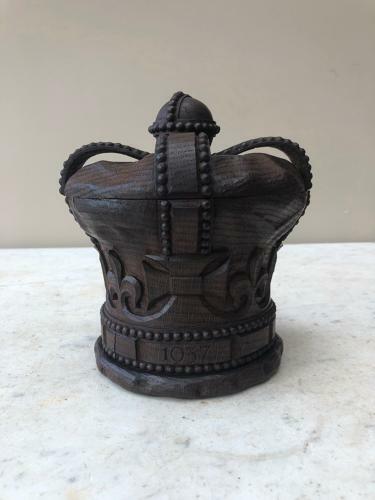 Unusual item...beautifully hand carved oak Kings Crown. Made as a caddy I presume and possibly missing its liner. Such a decorative item to display though and lovely carving. Around the base (small) the date 1937. GVIR. AD & ER. King George VI ascended the Throne on the abdication of his brother Edward VIII in December 1936. Edward's Coronation had been planned for 12th May 1937 and so it was decided to continue with that date for Edwards brother George VI. I think this is why Edward is round the base too.